Letter from Vesna Zabkar, conference chair ICORIA 2016. I am excited that this year the ICORIA is coming to the European Green Capital 2016 – Ljubljana, Slovenia. Slovenia, and its capital Ljubljana, is a part of a charming old world Europe, a gem between the Alps and the Adriatic Sea, which synthesizes old and new, tradition and innovation, human architecture and unspoiled nature. It is a story to be discovered, a place rich in culture, history, food, scenery and natural wonders. For more than 20 years the best creative minds of New Europe and beyond have gathered in Slovenia for an international advertising festival Golden Drum where creativity at its best is celebrated. With this tradition in mind, we are delighted to be the hosts of the ICORIA conference on research in advertising. The conference will be held at the Faculty of Economics, University of Ljubljana (FELU), which is located just north of the city center in Ljubljana. We are proud that it is ranked among the world’s most distinguished business schools (EQUIS and AACSB accredited), acting as a bridge between South Eastern Europe and the West. The university’s inner courtyard invites, with green areas and plenty of space for breaks and discussions. Pictures say more than words, so capture a glimpse by taking a virtual tour. The theme for this year’s conference is “Challenges in an age of (dis)engagement”. We will do our best to encourage an emotional and friendly engagement, with participants from different parts of the world and different areas of research in advertising. In line with the theme, our keynote speaker from Bruketa & Žinić OM, one of the world’s leading independent advertising agencies, will challenge our perceptions of advertising realities, traditions and the current challenges in this part of the world. The conference will begin on Thursday, June 30, 2016 with the 3rd Doctoral Colloquium. A welcome reception and the official start of the conference for most of the participants is planned for June 30 at the FELU. The gala dinner on Friday, July 1, will be held in a hotel within walking distance of the university. Following the last sessions of the conference on the afternoon of Saturday, July 2 we will organize a sightseeing tour of Ljubljana. Since Ljubljana’s city center is a pedestrian zone, the tour will be a city walk, including a funicular ride and visit to Ljubljana Castle, the medieval fortress above Ljubljana, a tourist boat cruise along the Ljubljanica River or a Slovenian culinary experience. More information about travel and accommodation in Ljubljana will soon be provided on the EAA website and on our Facebook page. 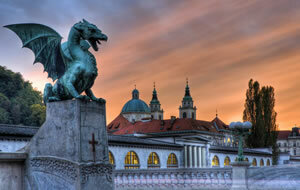 We recommend early accommodation booking since Ljubljana is a popular place to visit in the summer. In the name of the organizing team in Ljubljana I invite you to ICORIA 2016, and look forward to welcoming you to Ljubljana! In 2016 the colloquium will cover strategies for publishing and reviewing in academic journals as well as insider tips and career advise from Europe’s leading advertising researchers. All participants at the colloquium will also be invited to chair sessions in the ICORIA conference. The colloquium will take place on June 30 on the campus of the Faculty of Economics, University of Ljubljana. The sessions will start around noon and conclude with the ICORIA welcome reception late afternoon. The colloquium is open to PhD students participating in ICORIA 2016 on July 1 and 2 (see separate call for papers). To participate in the ICORIA 2016 Doctoral Colloquium please send a one page application in which you describe your dissertation project and briefly motivate why the doctoral colloquium would be important for you in developing your research career. Please send your application by e-mail to: sara.rosengren@hhs.se no later than May 6, 2016. Applicants will be notified about acceptance no later than May 13, 2016. The number of participants is limited and the selection will be based on the fit between research interests and ICORIA as well as motivations. If you're interested in presenting your work at ICORIA 2016, please submit a five-page summary of your paper as soon as possible, but not later than March 13, 2016 to: papers@icoria.org. Session 1: Meet the Advertising Editors. This session will provide attendees the opportunity to meet the Editors of the Journal of Advertising, International Journal of Advertising, Journal of Advertising Research, and Journal of Interactive Advertising. Each of the panelists will discuss the mission statement and the guidelines for authors submitting to their journal, while providing their insights into topics such as what distinguishes successful versus unsuccessful manuscript submissions, and common reasons why articles are desk rejected or are unsuccessful in the review process. Session 2: How to Write a Publishable Paper. This session will invite scholars with excellent publication records who will make practical suggestions as to how to improve the quality of manuscripts and how to avoid the common pitfalls in order to increase the chances of getting our article published. Potential topics may include how to organize/structure a paper; what to include in an introduction and how to substantiate the research contribution of the paper there; how to present an effective literature review, important issues and common mistakes in research design and analysis; how to state the main conclusions and implications; what to include, or not include, in discussion sections; etc. Session 3: How to Respond to Reviews. Manuscripts are almost never accepted at the initial submission stage. Rather, if promising, the authors are given the opportunity to revise and resubmitted. Thus, to be successful in academic publishing, you must not only prepare a strong initial submission, you also need to know how to best respond to reviewers’ (as well as AE’s and Editors’) comments. Therefore, this session will discuss strategies for responding to reviews; determining when changes need to be made to the manuscript itself and when they might not be; how to deal with common reviewer concerns; and how to craft comments in responses to reviewers. Session 4: How to be a Great Reviewer. Guidelines and suggestions for what to do and not to do in writing reviews will be discussed. This is perhaps the least discussed topic in graduate education and yet is a critical component to the publication system. Topics may include the relationship of comments to the author and comments to the editor, how much detail to go into about issues, how man issues to cover, length of reviews, common ways to organize reviews, topics to focus on, etc. Taylor & Frances will make a short presentation regarding the production of the journals and how the publisher can serve to help authors, reviewers and editors. The panelists are experienced editors, authors, reviewers and publisher who will provide their insights and advice. Attendees of this pre-conference are encouraged to either come to the sessions with, or submit beforehand, specific questions as ample time will be allotted for panelists to respond to audience members’ questions. The registration information can be found at the AAA website. Copyright 2016 European Advertising Academy.